Follow Cindy's board Bicycling for Women on Pinterest. 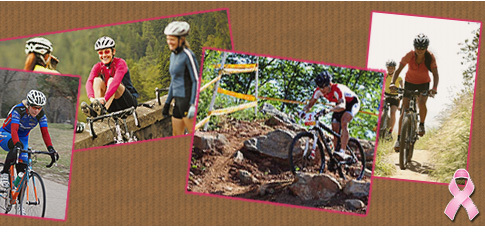 Biking4Women.com was created to build awareness of the importance of women's health and healthy living. Staying active is a big part of maintaining a healthy body and mind. For women, bicycling / cycling, including mountain biking, road biking, etc., is fun, gets your entire family involved and is the least expensive way to accomplish several goals at once. The purpose of this website is to help you and other women locate bicycle dealers / bicycle shops, biking trails, associations and clubs. You can also research the bicycle manufacturers that build bikes specifically for women, buy bicycle apparel and find links to other websites that may be of use. During my research, I've found several bicycle manufacturers that make bicycles specifically for women like Giant, Cannondale, Specialized, Trek and more. You can view these and the other bicycle manufacturers I've found here on this website. If I've missed any, please let me know by sending me an email. To make it easier for you to find a bicycle dealer close to you, I've put a map on the bicycle dealers page so that you can just choose your state. You'll notice that some dealers are in bold text, which means you can click on their name to do directly to their website. The bicycle trails I've found are also broken out by state to make searching them easier. If you would like to add a bicycle trail to this website, send me an email. As a woman, having the right bicycle apparel is really important to ensure you enjoy your riding experience. You will find links to great deals on bicycle apparel throughout this website. You can also promote your healthy lifestyle by ordering a Biking4Women.com t-shirt, mug, bumper sticker, etc. If you have a product you would like displayed, let me know via email. If you would like to have a link to your bicycle association or club website added to Biking4Women.com, please send me an email. Don't forget to check out my blog page. I'll share my ideas and tips with you from personal experiences and from the research I do as I continue to build this website, plus there's some pictures and videos from my cycling trips. Email me if you want a link to your bicycle shop on this website.